I feel like I have so much to say today! Even though I posted yesterday, that post was just about running (and Pure Barre). There’s so much more to my life than just my workouts! 1) My son had three outdoor hockey games this week. One Saturday, one Sunday and one MONDAY NIGHT. Monday nights are just brutal, especially when you have to be outdoors in the winter at 8:00 pm. I am pretty sure I lost feeling in my toes that night. 2) I became re-addicted to Gilmore Girls this week. When the show first came out back in the year 2000, I had just graduated college and still lived at home. I remember watching Gilmore Girls every single Tuesday night. But then I got married fairly quickly which meant I lost control of the remote at night so that put an end to most of my Gilmore Girls watching days. I’ve watched little bits through the years but now I am officially all caught up! In fact, I had never seen the series finale until last week! Now the Netflix episodes make so much more sense to me. 3) I made it to Panera twice during the week to work. The change of scenery is always nice although when I am in my writing groove, I tune out everything around me anyway. One day I ordered a salad for lunch. I even had them give me an apple with my salad which counted as the first apple to cross my lips since December. I am still not in the mood for apples though. The thought of a granny smith apple makes my stomach turn. 4) My son tried to pretend he was sick every day of the week but only succeeded in staying home on Thursday. I guess by Thursday I was worn down by his attempts? It’s okay because it meant I could run a little bit later in the morning since we weren’t on a school morning schedule. Running later = running outside so I was happy. Workout recap here if anyone is interested! I sort of forgot about the power bowl post, not realizing how many times it had been pinned! And my cold s’mores recipe is currently a top viewed post according to my stats so it’s definitely worth checking out. 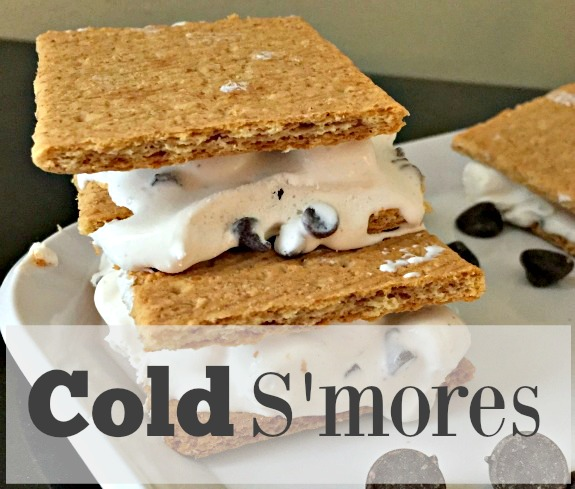 I really need to make these cold s’mores again because I love having a bunch in the freezer for a quick snack! 6) A major chocolate craving hit one night for m&m’s. I don’t know when I started loving pretzel m&m’s but I really like them. I can’t help but think about the healthier monster cookies I once made using pretzel m&m’s way back in 2015. Hold on, let me find that post…here it is. I need to make these cookies again! 7) I didn’t get pictures from dinner Saturday night but I’ve been really into spicy food. We went to Cinco de Mayo and really liked it. 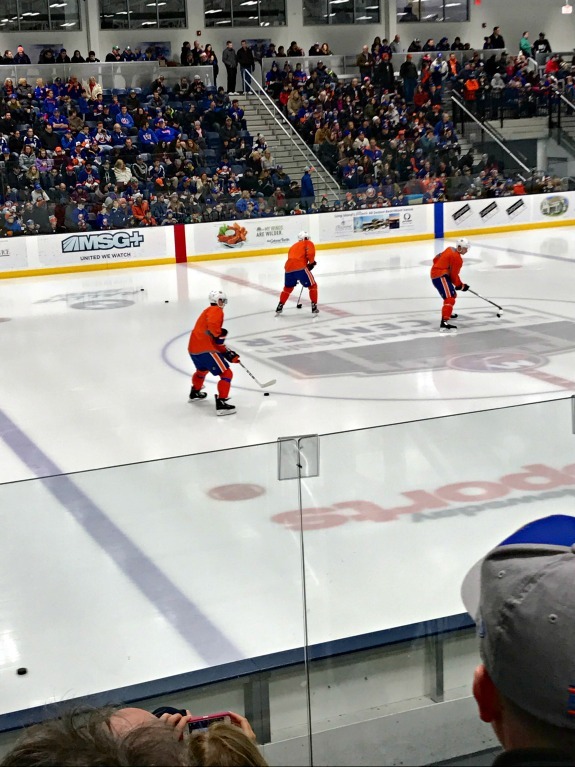 8) I was out early yesterday to take my son to see the Islanders practice before his hockey game. The Islanders lost both Friday and Saturday night but we don’t need to focus on that. 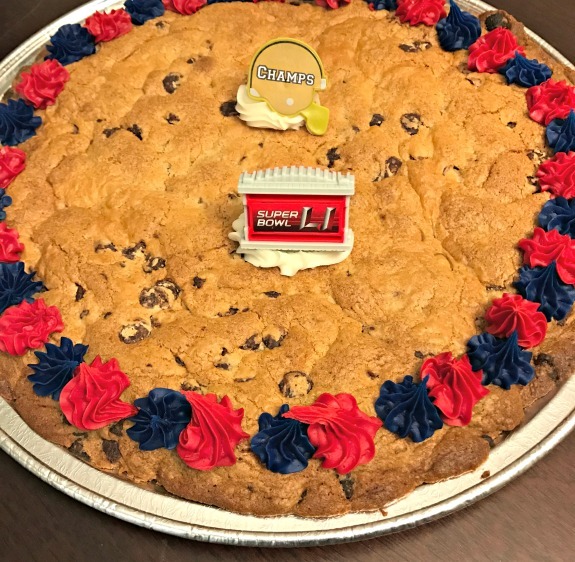 9) We picked a cookie cake for Super Bowl Sunday dessert. I liked this cookie cake but it was a little too crispy and crunchy for me. My favorite type of cookie cake would be soft and chewy. 10) And I feel like saying that I really like writing this blog in addition to all of the other writing I do about weddings and events. For me, writing on various topics helps to keep me creative rather than feel burned out and unproductive. Lately I have been writing more than my usual a lot for the event industry work that I do but writing about running, life and silly things (like Cold Stone being out of cookie dough) really keeps my mind happy and fresh. I think it’s important as a writer to write on multiple subjects rather than put all of your writing eggs all in one basket. What did you eat for Super Bowl? Do you have a cookie cake opinion? Soft and chewy or crisp and crunchy? 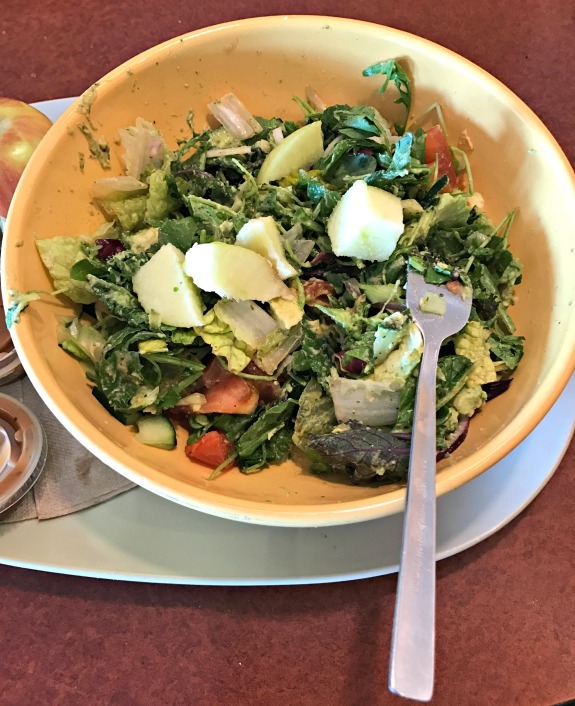 Quirky Eating Habits Or Disordered Eating? I could not imagine standing out in the cold on a Monday night to watch hockey. You are a good mother. I think I wold also prefer a soft and chewed cookie cake! Lisa @ Mile by Mile recently posted…How Much is Too Much? it was really cold last Monday night! I am ready for his spring season for sure. We ate chips and salsa and watched Superbowl commercials on YouTube last night. My mom used to make a really delicious cookie cake that was crispy but buttery. I has been so long that I don’t know what type of cookie cake I would prefer. ohhh buttery is so key to a really good cookie cake. Wow you spent a lot of time on the ice last week, or at least watching things on ice. I can see why iced smores would be on your mind, although you know have me craving pretzel M&M’s. I had lots of cake last week and my chocolate on chocolate on chocolate slice made me think of you. Gilmore Girls is one of my all time favorite shows. The writing is just so well done, even if it’s a little unrealistic. I still haven’t watched all of the new episodes. My girlfriend do about one every month. It’s a nice reprieve from life. that chocolate cake in your post looked so good! I never loved the pretzel m&m’s but then lately, at least over the last couple of years, I really learned to like them a lot! My husband plays league hockey and I always catch up on my Gilmore Girls when he’s gone…it’s glorious. As for cookie cake, I am particular: I like it crispy/chewy at the edges and soft in the middle and of course warm with ice cream. Whenever I order dessert, I sound like I’m quoting When Harry Met Sally. ha! yeah, the middle of the cookie cake needs to be soft. and the ice cream definitely helps. how funny!! we really liked that restaurant. I went to a greek place in that area recently too! Not putting all writing eggs in one basket – agreed! Reducing myself to just either light-hearted/fun writing or deeper thoughts doesn’t work and feels self-limiting. 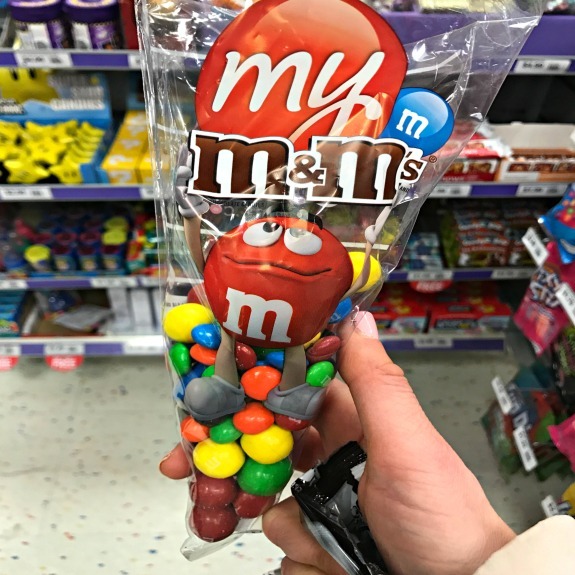 Pretzel m&m’s?! What’s this magic we apparently don’t have over here? As a fan of salty and sweet combinations these sound right up my alley. Gilmore Girls is an awesome show. I got onto it a mere few years ago since we didn’t have cable yet when it was still on TV regularly. Or maybe we did but it wasn’t popular among my friends so I missed out on it. you need to somehow try pretzel m&m’s!! they came out a few years ago. at first I didn’t like them but lately I really do! Cookies should always be soft and chewy. This weekend consisted of a 10K, church, and Super Bowl party at our house. yes to soft and chewy cookies!